We all have too much STUFF! Not just tangible things, but also the harmful clutter we allow to take up residence in our hearts, minds, bodies, and souls. 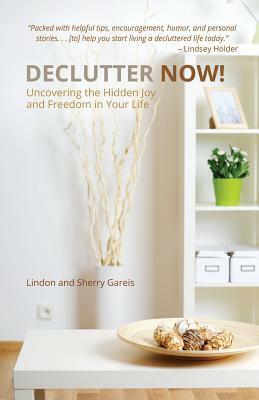 Every area of your life must be decluttered for you to live with the joy and freedom God desires! We'll clean out closets, relationships, and finances. We'll share ideas on decluttering your children's lives from the get-go, and how to instill tools they'll need to keep them that way. We'll navigate through challenges at work and critical career decisions. We'll tackle those too! Does your spiritual life feel empty or stalled? We desire to help! Declutter what you don't need to make room for what really matters. Less can truly be more! Do you long for more peace and harmony in your life? Do you desire more quality time with family? I hate clutter and love organizing. If I could organize all day (sometimes I do ) then I would be so happy. This book had a lot more details than I was expecting. It's a great book! Especially if you struggle with clutter but this also goes into the financials issues we have and spiritual life. It really does go into detail on all the above listed topics and I really like how the book is set up. This is more of a personal reflection book so there are questions to fill out and you can do this as a study with others as well. If you are wanting to de-clutter any or all parts of your life (it's not just stuff) you should read this book! Learn more about this study guide here.